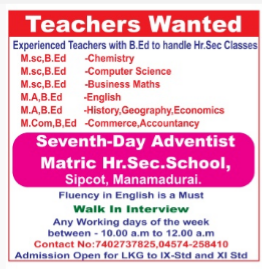 Seventh-Day Adventist Matric Hr Sec School, Manamadurai has advertised in THE DINAMALAR newspaper for recruitment of Teaching/ Non Teaching Faculty jobs vacancies. Interested and eligible job aspirants are requested to walk-in this week.Check out further more details below. (b)Fluency in English is Must. Interview Date: walk-in on any working day of this week between 10 a.m to 12 noon.